The Arc of Tippecanoe County | The Arc of Tippecanoe County is committed to all individuals with developmental disabilities realizing their goals of learning, living, working, and playing in their community. 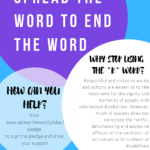 Spread the Word to End the Word- Dance 2019!! Where: Purdue University Co Rec 355 N Martin Jischke Dr, West Lafayette. THIS EVENT IS OPEN TO ALL ARC MEMBERS and IS FREE!!! This event will feature music, dancing and crafts to celebrate the end of Disabilities Awareness Month. We also encourage everyone to bring posters or pictures with the theme SPREAD THE WORD TO END THE WORD! The Education Committee will be meeting on Tuesday evening at the Opportunities for Positive Growth Offices on 36th Street at 4:30. We will be discussing the Resource Fair and planning the upcoming Caregiver Support events. T–his meeting is open to everyone. Contact Milissa at 765-476-3277 or director@arcoftippecanoe.org for more information. Come find out what is new with the Education Committee and upcoming educational/advocacy events. Comments and ideas are always welcome. All Arc Bowling to Celebrate Disability Awareness Month!! Includes 2 hours of bowling, free shoe rental and meal. Payment is required along with RSVP for anyone bowling or eating! with name of Arc Member and number of staff/family participating in event. You will receive a confirmation email when you RSVP this is proof that you RSVP’d. Please remember to only RSVP if you plan on attending this event. The Arc will order food based on the number of RSVP’s we have. If you do not show up, we still have to pay for your meal. This could result in prepayment of future events. Call The Arc with questions- 765-476-3277- about event not Arrowhead! !